A line from the first song off his latest record seems like a challenge to himself. Throughout his career as an artist, Tyler the Creator, aka Tyler Gregory Okonma, has been expanding the types of creative projects that can be associated with one’s own brand. His work is far from singer-with-a-perfume-line status. Although there’s certainly a team helping him to expand his creativity, his hand is involved with everything his name is on. From comedy on early YouTube’s “Loiter Squad,” to Adult Swim and even a Viceland show where he learns how to do new things, his vision crosses many art forms. This ever-growing empire began with a group of high school friends making music, skateboarding, and essentially just messing around on the internet. American streetwear is a modern trend that hit mainstream audiences when Supreme did. Their marketing method of creating hype but limiting product is one that Golf Wang, and his new line Golf le Fleur know and utilize this as well. Street fashion in major cities melds together high fashion brands with low-brow thrift shopping and skateboarding. 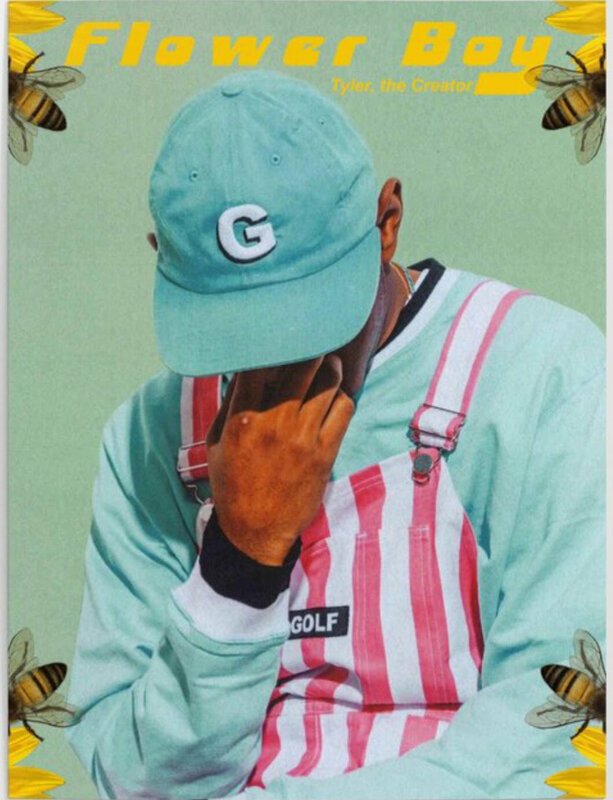 Tyler the Creator’s entrepreneurial spirit quickly turned to designing and producing his own style of streetwear, early Golf Wang designs incorporating a wide variation of bright and pastel colors, stripes, and the infamous donut-hole logo. His bubblegum-candy style took over the scene, which was primarily dark colors. Many of the early designs from Golf Wang are incredibly difficult to find, as the brand released a small number of products, and they are considered collector’s items as well as clothing. Most articles from these collections are resold at absurd values, and collectors are able to make money from reselling garments. There’s a whole culture of reverence and hype surrounding the Odd Future collective, culminating with Camp Flog Gnaw Carnival, a festival that takes place in California and is also perpetually sold out (it takes place in November, is already sold out). Many of the artists on Odd Future including Tyler himself don’t tour often, and with prices increasing in resale value, it’s difficult to ignore the exclusivity of the brand. All of this success has uplifted those around him as well, friends like Frank Ocean and Earl Sweatshirt achieving popularity. Streetwear climbing onto the ledge of high fashion has allowed a DIY sport like skateboarding to gain mainstream respect, with skateboarders acting on mainstream TV, on The Walking Dead and producing Viceland shows. Floral patterns abound, as well as bold colors, turtlenecks and collared shirts bring a new image to street attire. 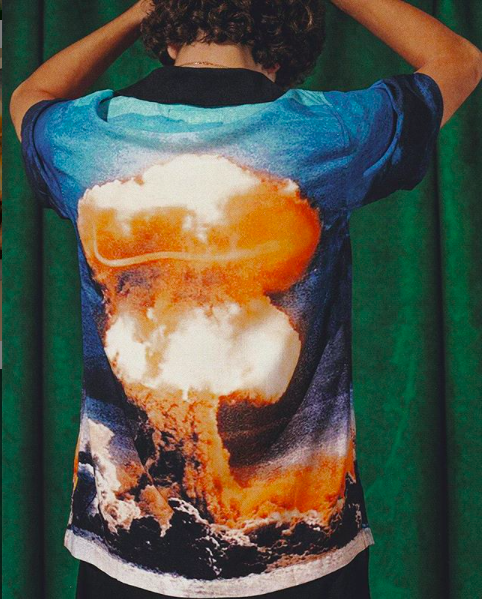 Some articles feature text, like a fake bulletproof jacket that reads, “No violence,” which is juxtaposed by, for example, a bowling shirt with an image of a nuclear bomb exploding. The release of “Flower Boy” brought a previously unseen side of Tyler, ditching the horror-comedy style of previous records in favor of something that felt more honest. But ever-present is this juxtaposition of darkness and light, the desire for improvement, and harsh realities. His designs are loose-fitting, (ideal for skating) and his preoccupation with sneakers has not left the realm of the flat-bottomed, rubber sole skate shoe. His recent partnership with Converse has brought forth a line of brightly colored shoes ranging from mustard yellow to Grinch green, and even includes a pastel blue, short-sleeve boiler suit. 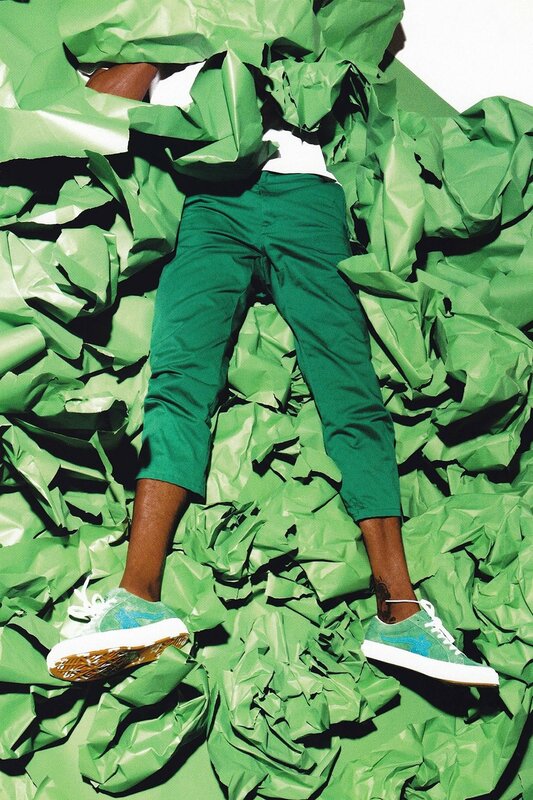 These designs, like Golf Wang feature a simple logo: a duotone flower. This is featured on several garments; pink and orange on a fluffy cream trench coat, and varying colors sides of his sneakers. The latest Converse collab places the Converse star within the center of the design. Tyler continues to be a source of inspiration for young creatives. His entrepreneurial spirit reminds us all that there really are many roads, how far we go is about how much drive we have.